Making decisions is a core activity in schools. Every school has faculty teams that meet regularly to make decisions concerning logistical, administrative, academic, and social issues. The thesis of this chapter is that team decisions will be more effective and efficient when they occur in the context of a formal problem-solving model with access to the right data, in the right format, at the right time. We focus in this chapter on problem solving and data-based decision making related to behavior support in schools because that is where our experience has greatest depth. 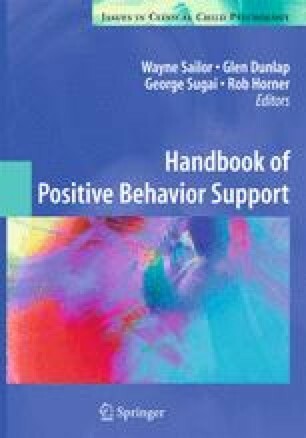 The principles and practices regarding problem solving and data-based decision making about behavior support, however, also extend to academic achievement and other areas of support. Themes emphasized throughout this chapter are that data-based decision making (a) occurs in the context of team meetings with a “structure” that sets the occasion for effectiveness; (b) is embedded in a formal problem-solving model with processes that ensure a meeting is logical, thorough, and efficient; and (c) is continuously informed by accurate and timely data.